Trinity is NorCal’s jewel of alpine lakes and granite peaks – many above 8000′ elevation, about 40 miles inland from the ocean. Trinity is located in between the infamous redwood coast and the I-5 corridor. Rivers, creeks, lakes, and trails into the high elevations regions, bqckpackers and equestrian campers alike. Hiking trailheads are accessed from all sides -On the east side you have Trinity Lake & Trinity River w/ Highway 3 running lengthwise in a north-south direction. Hwy 299 runs east-west along the south side of the wilderness. Klamath River Hwy 96 lies on the west side of the wilderness. Salmon River, Scott Mountains and Cecilville are north of the alps. 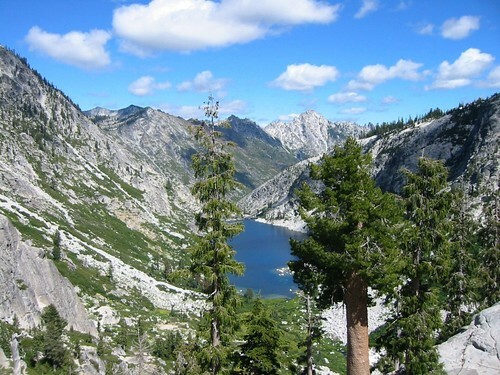 Both the small Russian Wilderness & the larger Marble Mountain Wilderness are located to the north of Trinity Alps, along with rural towns near the Scott Mountains and the Salmon River. Castle Crags Wilderness is to the eastern side, near Interstate 5. The mountainous area is quite unique, as exposed granite mountain peaks and alpine lakes are pretty rare in the coastal Cascade ranges. The only other spot in California that has an 8000′ peak nearing the coast is just north of Los Angeles – Los Padres’s Mount Abel & Mount Pinos peaks, both over 8000′ in elevation. The USDA map for Trinity Alps Wilderness was outta print for nearly 2 years and it has recently been updated and reprinted. New edition released in 2013 and now available at the Total Escape map store. Printed on waterproof map paper and updated in 2012.